In 1807, two Newfoundlands were bred to local dogs in Maryland. 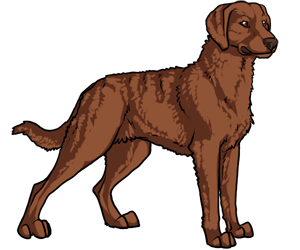 They were bred from the English Otter Hound, Flat-Coat and Curly-Coated Retriever. The breed was developed along the Chesapeake Bay, hence the name. The state dog of Maryland. Toughest water retriever, even in icy cold water. American Chesapeake Club was founded in 1918.